When you want the best, come to Colerain Golf Car Sales. Our name is synonymous with exceptional quality and value. 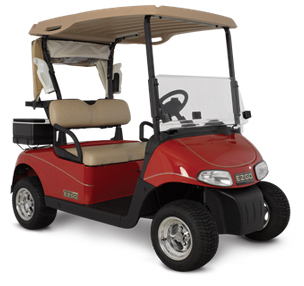 We offer a wide range of the most popular new and used brands in the business including E-Z-GO, Club Car and Yamaha. Our quality cars can be used for any purpose imaginable including golfing, farming, camping and industrial transit. Our technicians are here for all your service needs from quick tune-ups and battery changes, to rebuilding entire golf car engines from top to bottom. We also have an on-site fabrication shop for all of your modification needs. Need us to come to you? We also offer on-site services calls. Contact us to find out what we can do for you! » Learn more about our service department. Need a more personalized vehicle? We offer complete customization services for your golf car. We can customize any new or used cart into the vehicle of your dreams. We can add seats, lighting kits, wheels, tires and custom paint your ride to match any theme. Need your cart street legalized? We can do that! We’ll meet your local requirements and you’ll be ready for the road. Check out the full line of E-Z-GO models. Watch our latest television commercial.